Who am I? I house more than 50,000 garments spanning from the 18th century to the present as well as over 4,000 pairs of shoes. I’ve hosted over 200 intensively prepared “beautiful and intelligent” shows, symposiums, book signings and am regarded as the center of research and ultimate fashion insider knowledge by none other than Michael Kors. I am currently celebrating my half-century anniversary with a spectacle befitting my fashion icon status. 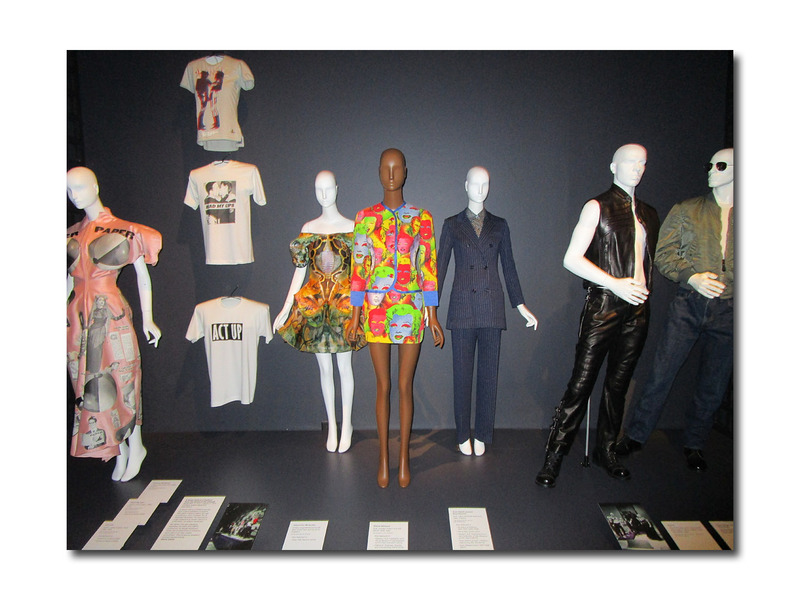 I am “Exhibitionism: 50 Years of The Museum at FIT” now through April 20. 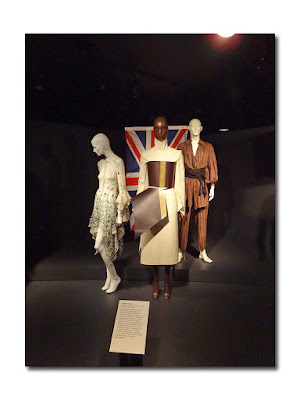 If you’ve ever contemplated what is actually involved in launching a fashion exhibition or how MFIT has managed to regularly produce initially four, and now five shows a year, this should be on your must-see list. Valerie Steele, chief curator since 1997 and director since 2003 would like you to approach this exhibition head on. “Put yourselves into it. 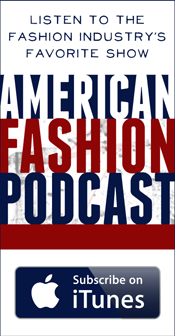 What kind of fashion exhibition would you like to see? What kind of questions do you want to ask of clothes?” she said during yesterday morning’s press preview. “Exhibitionism” is a chance to see snippets of 33 of the most influential installations -- a few favorites which they were not able to revisit since the museum doesn’t own the clothes (such as the Bob Mackie, Versace and Susanne Bartsch exhibitions) are visible via slideshow in the opening room. It is interesting to see the curtain pulled back a bit on how these exhibitions come together – it literally takes a village to coordinate all the logistics with the creative. “ It’s a lot more than just putting a dress on a mannequin,” adds Steele. Curators Richard Martin and Harold Koda came onto the MFIT scene at around this time, launching still more important exhibitions along with a much needed conservation laboratory to care for the ever growing (and aging) collection of textiles and garments. Koda famously went on to The Met’s Costume Institute however MFIT presented exhibitions on China (“China Chic: East Meets West”) as well as designer Charles James (“Charles James: Portrait of An Unreasonable Man”) long before The Met did their versions. Steele pointed out how the title of the 2015 exhibition “A Queer History of Fashion: From the Closet to the Catwalk,” had to pass muster with an advisory board who wasn’t keen on the closet idea. “Work with me here, it’s a fashion exhibition,” she said of the clever moniker. According to Steele the “Ivory Tower attitude” toward fashion has not really changed that much. “You can get work as an adjunct at a museum,” she explained “but there are not a lot of full-time jobs available.” Speaking of education, “Exhibitionism” was co-curated by Colleen Hill who is off at Central Saint Martins writing her (apparently very complicated) thesis so good luck to her! Last night’s party to fete the opening of Exhibitionism: 50 Years of The Museum at FIT, hosted by Dr. Joyce F. Brown, President, Fashion Institute of Technology and Dr. Valerie Steele, Director, The Museum at FIT, was unsurprisingly packed to the gills and highly spirited. 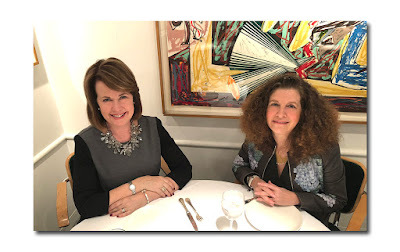 How timely and apropos that this revered New York institution, which Michael Kors referred to as “the fashion insider’s fashion museum” (you can’t argue with that) would be so honored smack dab in the middle of New York Fashion Week. There have been approximately 200 exhibitions since the 1970's and I have been fortunate enough (or old enough lol) to have seen most of not many of them originally. 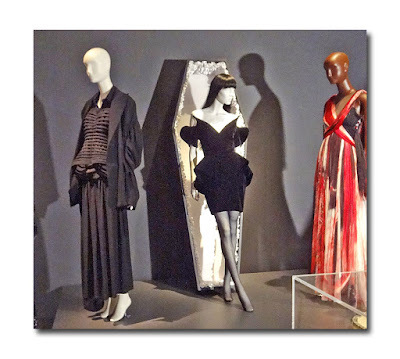 In celebration of its five decades, 80 looks were culled from the museum's permanent collections, representing 33 of its most influential, curated by Dr. Valerie Steele and Colleen Hill, curator of costume and accessories. To make the final decision about which made it into the exhibition, Dr. Steele consulted with her colleagues Patricia Mears, Fred Dennis, and Colleen Hill about which shows they thought were most important. Among those which can be considered to be groundbreaking: Fashion and Surrealism, 1987; A Queer History of Fashion: From the Closet to the Catwalk, 2013; Black Fashion Designers, 2016; The Corset, 2000. When I asked Dr. Steele what her favorite exhibition was she said "it is always the next one". On hand to celebrate were the museum’s Deputy Director Patricia Mears and Senior Curator Fred Dennis, Couture Council board members Yaz Hernandez, Eleonora Kennedy, Sharon Jacob, and Darcy Rigas, fashion designers John Bartlett and Victor dE Souza, legendary model Veronica Webb, super stylist Freddie Leiba, creative director/forecaster Nicole Fischelis, and Fern Mallis, who has found herself in the news as of late. The woman who created NYFW arrived at a show on Tuesday to find that she had been assigned a standing-room spot in the back of the room. Oops! While she did not want to divulge the name of the company, Page Six reported it was Nihl, a menswear company. Fashion consultant, television personality, actor, and author Tim Gunn was on hand to give a champagne toast to fete the occasion. He, Patricia Mears and myself not only bonded over our love of the museum and fashion, but our shared educational experience: all three of us are graduates of The George Washington University. Because there was not one specific theme of the evening, but many, it was a night where anything goes in terms of fashion. There were women in semi-formal dresses (such as Yaz Hernandez), men and women in giant puffers, and some bedecked in exotic vintage hats. One eclectically put together woman was carrying a large vintage leopard bag which I was admiring and then remembered I owned the same one. The company has quite an interesting back story. Ludovica initially decided to produce crochet dolls made by inhabitants of the island who were left without work after the tsunami in Indonesia in 2004. But it was in 2009, that her fortunes would change. She met Karl Lagerfeld during a Chanel fashion show in Venice and gifted him with a Mua Mua doll in his likeness. He liked it so much they began a collaboration and 500 dolls were sold in Lagerfeld stores. She became an instant success. 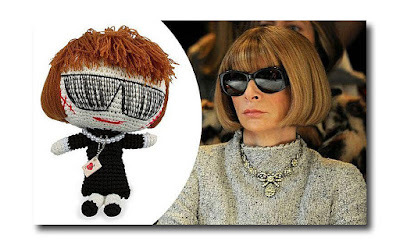 The family of crochet dolls includes Anna Wintour, Queen Elizabeth, Lady Gaga, Coco Chanel, Franca Sozzani, Anna Dello Russo, and others. They are a brand in themselves and sold in some of the most important concept stores and e-commerce in the world. Each doll is made in Bali and part of the proceeds are donated to a school in Sumbawa to help and support female education.